Moriah was the home church of Evan Roberts, who led the Revival in 1904-05 which started in the Calvinistic Methodist Church and spread to other denominations. An estimated 100,000 people in Wales became Christians as a result. Methodists in the Loughor area initially met in a farmhouse, on the opposite side of the road to where the first chapel was built in 1842. That year is inscribed in a stone on the building, which is now the chapel’s schoolroom. The main chapel, which stands alongside the original one, was built in 1898 at a cost of £1,700. Evan Roberts was a coalminer, living at Island House in Loughor. Later he became an apprentice blacksmith. While he was working in the smithy he felt a powerful compulsion to spread the Word of God. 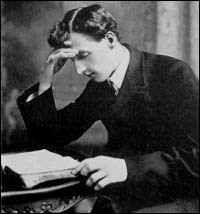 The Revival started in a prayer meeting in the Moriah schoolroom on 31 October 1904, when Mr Roberts was 26 years old. Many Revival services were subsequently held in the main chapel. Meetings lasted until the early hours of the morning and attracted people who wouldn’t normally worship. People forgave their enemies, paid their debts and returned things they had stolen. Drunkenness and crime reduced dramatically as people’s lives were changed. Mr Roberts and his group of singers who led the meetings travelled to many different parts of Wales preaching the gospel. Large crowds were drawn to the meetings and many new chapels were built. He moved to Leicester in 1906, Brighton in 1924 and Cardiff in 1930. People came to Wales from many countries to see what was happening, and Welsh missionaries preached the gospel overseas. The Welsh Revival’s influence spread to many places including Germany, Scandinavia, Russia, America, Patagonia, Central and East Africa, India and Korea. A decade after the Revival had broken out in Wales, five continents had experienced its influence. Click here to read the HistoryPoints page about Evan Roberts’ memorial column (near the road in front of Moriah Chapel) and his grave (behind the chapel). A message from the congregation: “We thank God for the work of the Holy Spirit and for His faithful servant Evan Roberts."